As evidenced by the Vintage 6 Drawers Dresser by Moe’s Home, there’s no need to sacrifice eye-catching style in favor of a simple silhouette, or efficient storage in exchange for environmentally friendly construction. 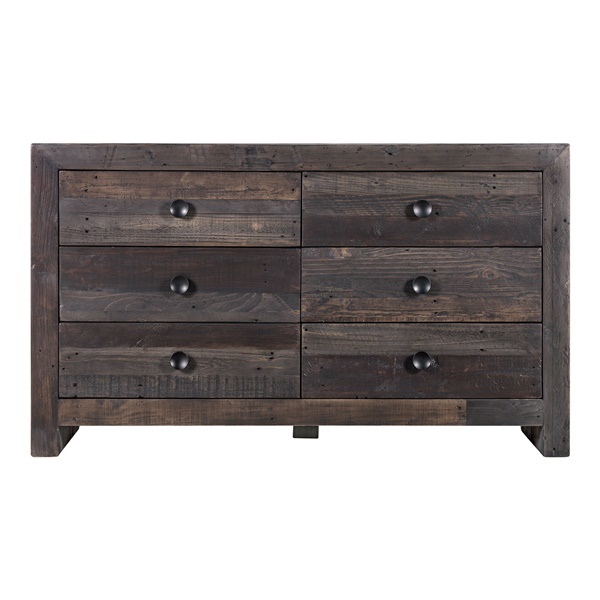 Crafted in a clean-lined contemporary design of ruggedly rustic recycled pine, Moe’s Vintage 6 Drawers Dresser offers ample stashing space beneath its unique surface adorned in various finishes. Out of the ordinary yet easy to incorporate, Moe’s Vintage 6 Drawers Dresser is ideal in a modern motif or eclectic aesthetic, whether on its own or arranged along with other Vintage pieces by Moe’s Home. Sharp modern silhouette with rustic edge. Environmentally responsible construction of recycled pine. Complements other pieces from Moe’s Vintage collection.